So, Karl. Karl Lagerfeld. He’s obviously a well known individual in the fashion industry. I mean, it’s not like he designs for Chanel or anything… No wait, yes, yes he does! 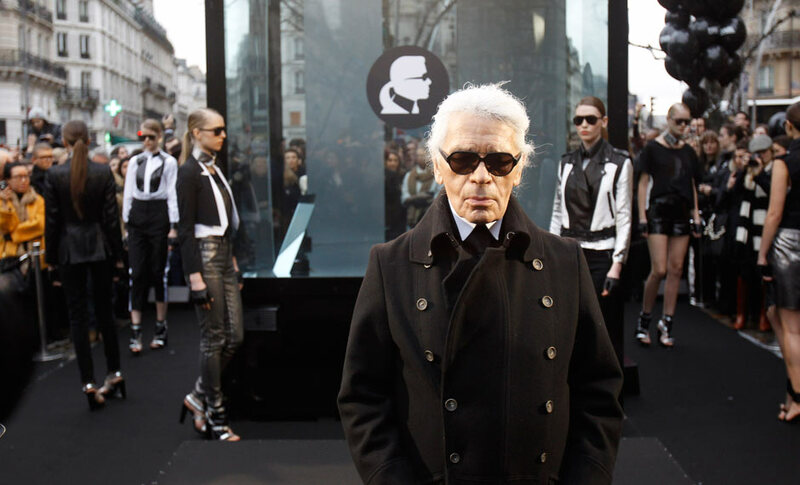 But Karl Lagerfeld has his own line called Karl Lagerfeld Paris which has just released North America only pieces for stores. Because I’ve been following the development of this line in North America through magazines, I knew it was coming but honestly didn’t expect it anywhere other than Saks, and at prices way out of my pocket-range. Thanks to go ol’ Instagram, HBC posted a photo of the line and mentioned they would be available online. I went to check and lo-and-behold, there was Karl’s new line in all it’s glory! So I went to check out the line in person, too. What I love about this line is the very clear Chanel influence, but it’s very feminine, chic, and ready for business rather than the runway. Now, I can’t guarantee that you’ll be too blown away by this line, and so many pieces are made of polyester that I want to throw up, but there are a few key items that really stand out from the lot. Where the line really shines are the shoes and the bags! The Tilda 2 Tweed Flats flats just melt my Chanel-loving heart, and the Exposed Zipper Nylon Mini Backpack is so, so amazing. And while I’m not one for logos on t-shirts, I’ll gladly have Karl and the Eiffel Tower across my chest with the Eiffel Tower Crew Neck T-Shirt. Any of the tweed items have a very lovely look and feel to them, and the t-shirts are just fun. If you go to Karl’s website, you can find the designer and limited edition pieces that won’t be found in the stores, as well as a wider selection of wears. Obviously, the limited edition items are on the higher end of cost, but still immensely comparable to Chanel pieces. I love that this line is approachable for any woman, affordable, and, while clearly marketed for a business-woman demographic, pieces can be extracted from the collection and added to street style and younger looks. So which piece is your favourite? Do you plan to pick up something from this collection? Let me know in the comments! Special NYC trip & the Challenge of Packing a Practical Carry-On! Visiting the Kiehl’s Flagship Store in NYC – Informative Specialists, Innovative Products, Astonishing Experience!